Why Does Weight Affect Stall Speed? We are taught early in our flight training that the reason an airplane stalls has to do with angle of attack (AoA) and not airspeed. Yet we tend to think, talk, and fly in terms of stall speeds. The reason is rather simple: light airplanes have been conventionally equipped with airspeed indicators, not AoA indicators. Moreover, aircraft manufacturers provide us with stall speeds in their flight manuals. Even though stalling is all about AoA, stall speeds provide us with convenient reference points for our flight operations. Unfortunately, the focus on “stall speed” sometimes leads to confusion and misunderstanding. The reality is that speed by itself is a poor surrogate for AoA. But the real confusion that traditionally comes into play is the affect of weight. Pilots tend to overlook it when considering "stall speed" and misunderstand the roll it plays in stall dynamics. So what is an airplane's stall speed? The answer is, "It depends." If we frame the question to include a reference to weight, meaningful answers follow: What is the stall speed at “X” pounds? What is the stall speed at “Y” Gs? What is the stall speed at “Z” degrees angle of bank (bank angle suggests load factor)? A specific stall speed can be provided in response to each of these questions. Weight must be included in any discussion about stall speed; the two are connected mathematically. The relentless pull of gravity is balanced by lift from the wing during normal flight operations such as steady, level flight. This balancing act is what links an airplane’s stall speed to its weight. Lift is one of the forces generated as a result of air flowing around a wing. Its magnitude depends upon four variables: air density, airspeed, wing area, and coefficient of lift. As the pilot, you directly control lift by changing the wing’s AoA. For a constant amount of lift in unstalled flight, an increase in AoA results in an increase in coefficient of lift, but a decrease in airspeed. A decrease in AoA results in a decrease in coefficient of lift, but an increase in airspeed. An airplane’s weight at any point during flight is the sum of two parts: gross weight plus induced weight. Load factor is a measure of the combined effects of gross and induced weights. Gross weight consists of all the components of the airplane plus all the stuff loaded into it, e.g., fuel, oil, people, and baggage. Think of gross weight as the number seen on a scale before you take off. It is the same value used for weight and balance calculations. By comparison, induced weight can be imposed by elevator inputs and gust loads/turbulence. A coordinated, level turn at 60 degrees of bank in smooth air, for instance, results in an airplane that feels and acts twice as heavy compared to wings-level flight. As shown in the graphic, lift equals weight (L=W) when we are in steady, level flight. And when flying at the critical AoA, we also have the maximum coefficient of lift. These conditions create the connection between weight and stall speed. All things equal, speed is the only variable that can change to preserve L=W as weight changes—in this case, the stall speed at critical AoA. Higher weight, higher stall speed; Lower weight, lower stall speed so that lift can continue to equal the weight. By definition, stall speed (Vs) is either the stalling speed, or the minimum steady flight speed at which the airplane is controllable. Consider the former definition for our purposes. When at Vs, we are operating at the wing’s critical angle of attack with maximum coefficient of lift. Stall speeds are usually published for an airplane in particular configurations at maximum gross weight. For example, the Pilot’s Operating Handbook for the 1978 Cessna 152 has stall speed tables for max gross weight with the power off. Stall speeds are shown as a function of flap deflection and bank angle. “Bank angle” is an oblique reference to the load factor necessary to maintain a level turn. As bank angle increases, so does the required load factor, and so does the stall speed. Shallowing the bank reduces the stall speed. Operating the airplane at a lower gross weight similarly reduces stall speeds as well. Indicated airspeed (IAS) is shown on the airspeed indicator. In contrast, calibrated airspeed (CAS) is IAS corrected for instrument and installation errors. When performing calculations involving stall speeds, it is important to use CAS. This often requires consulting the airspeed calibration chart provided in the airplane’s flight manual to convert between IAS and CAS. Ok, so what does this have to do with maneuvering speed? The answer is simple once you know the code. Design maneuvering speed, Va, is the maximum speed at which you can move a single flight control to its full deflection without risk of damage to the airplane. Instead of generating structural loads that could bend or break the airplane, it stalls instead. In other words, Va is the stall speed corresponding to a specified design limit load factor (G-load). That’s right. Va is just another stall speed. An airplane’s design limit with its flaps up and no rolling in the Normal category, for example, must be at least +3.8G. The corresponding stall speed at this load factor is roughly double the +1.0G stall speed, or 2.0Vs (CAS). Think of Va as the “upper limit” stall speed for a given weight and configuration. In the range of speeds from Vs through Va (i.e., 1.0Vs–2.0Vs CAS), the airplane will stall before it can bend or break. The stall acts as an aerodynamic relief valve to prevent structural damage. Above Va, however, the airplane could suffer structural damage or failure before the stall can intervene. As you play with the interactive graphic, notice how lift, Vs, and Va follow the weight trend. Increasing weight necessitates an increase in lift. All other things equal at the critical angle of attack, the additional lift can only be achieved with a higher Vs. Conversely, decreasing weight requires a decrease in lift. All other things equal at critical angle of attack, the reduced lift is achieved at a lower Vs. Since Va is a stall speed, it changes as well. Rich Stowell is the 2014 National FAASTeam Representative of the Year and the 2006 National Flight Instructor of the Year. 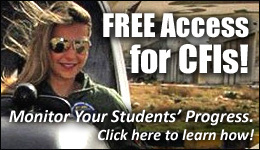 The Gold Seal Ground School is the best choice for student pilots. With its engaging multimedia format it makes preparing for the Private Pilot knowledge test AND practical test easy and fun. Sign up for free and take 1/3 of the entire course without paying one cent. Plus, Gold Seal includes its trademark "Forever Guarantee". There is no time limit - if you decide, at any time, that you are dissatisfied we'll remit you a full refund. No other training package offers you anything like this. Come take your free test drive right now.